What is flexitarianism, and can reducing the amount of meat we eat have that much of an impact? Cutting back on meat and dairy is one of the ways many of us are looking to start healthier habits. Flexitarianism is on the rise, with more and more British meat-eaters buying vegan and vegetarian products as part of their weekly shop. 40% of us now spend over £25 each week on meat-free alternatives, thanks to our growing awareness of the health and environmental impacts eating meat can have. A flexitarian diet, also known as ‘casual vegetarianism’ has become an increasingly popular choice. A plant-based diet that can not only improve your health, but is also thought to help reduce your carbon footprint, it’s still considered by some to be ‘vegetarianism with cheating’. A style of eating that encourages individuals to eat more plant-based foods without banning meat or other animal products, in essence, it’s a way of eating that is all about moderation. The majority of meals are vegetarian while still allowing occasional meat dishes. While pescetarians, vegetarians, vegans stick to more rigid guidelines around what foods are allowed, flexitarianism is a popular choice for those looking to change the way they eat without as many restrictions. What’s included in a flexitarian diet? While no foods are outright banned, when it comes to meat, it’s suggested you try and choose good quality, leaner options such as chicken or turkey over red meat (beef, lamb or pork). Processed meats are often not only high in saturated fat and salt, but offer little in the way of vitamins and minerals. Where possible, it’s best to include at least one plant-based food as part of every meal, with five or more portions of fruit and vegetables a day. Wholegrain options are also better than their refined counterparts. Good, plant-based sources of protein can include beans, lentils, nuts, peas, and seeds. Increasing the number of lentils and beans in your diet is also thought to help reduce high cholesterol, making these must-haves as part of your meal planning. Some nuts and seeds including flaxseed, pine nuts, sunflower and sesame seeds, as well as walnuts are all thought to help maintain healthy cholesterol levels whilst providing essential fatty acids. Why cut back on meat and go flexitarian? Decreasing the amount of refined foods with added sugar and salt you consume, whilst increasing the number of fruit, vegetables, legumes and whole grains you consume are thought to lead to a number of health benefits. These can vary depending on just how much and what kinds of meat and dairy you still include in your meals, however, based on research into vegan and vegetarian diets, we can get an idea of how a flexible-vegetarian diet can still benefit us. 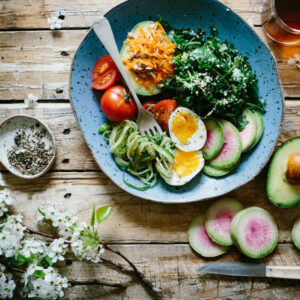 Health benefits – as well as decreasing high cholesterol, a flexitarian diet may be able to lower your risk of type 2 diabetes, decrease risks of heart disease, and help with weight loss. An 11-year study of 45,000 adults found that vegetarians are at a 32% lower risk of heart disease compared to non-vegetarians, while a review of 32 studies revealed vegetarian’s systolic blood pressure (the pressure in your blood vessels as your heart beats) is on average seven points lower than that of meat eaters. Environmental benefits – switching to a plant-based diet can have a surprising impact on the environment. By reducing how much meat we are eating, we can help preserve resources, decreasing the amount of water and land needed for food production whilst further decreasing greenhouse gas emissions. Nearly 15% of all human-caused greenhouse gasses are produced by livestock. On average, plant protein takes 11 times less energy to produce than animal protein, meaning that switching from a typical western diet may be able to reduce greenhouse gas emissions by up to 7%. Are there downsides to eating less meat and dairy? As with any way of eating, what we choose to include or exclude can have an impact on our health and well-being. If you are careful when planning your meals, there shouldn’t be any problems. However, there are a few common areas to watch out for when reducing the amount of meat and fish in your diet. Iron and zinc – if you are reducing the amount of red meat you eat, it can be worth making sure you are including plenty of alternative sources of iron. Dark, leafy greens such as kale and spinach can help with this, or if you’re looking to boost your iron and zinc intake, adding nuts, seeds, whole grains and legumes into your diet can help. Adding an extra source of vitamin C in the form of citrus fruits, strawberries, melon or bell peppers can all be good ways to help increase iron absorption from plant-based foods. Omega-3 fatty acids – if you are reducing the amount of fatty fish you eat, it can be worth adding more walnuts, flaxseeds or chia seeds to the menu, as these can all be good alternative sources of omega-3 fatty acids. Vitamin B12 – as B12 isn’t generally found in plant-based food, if you are cutting back on animal products that this is naturally found in (fish, meat, eggs, milk, poultry), it can be worth taking vitamin supplements to boost this. Some fortified breakfast cereals can also be sources of synthetically made B12, and also often offers a boost in vitamins A, C and E. Just be careful not to select a brand that has added sugar. If you are cutting back on dairy, vegan milk (fortified nondairy milk) such as soy, almond and rice milk can be a good source of B12. Should I try a flexitarian diet? If you are looking to make smarter food choices, flexitarianism can be a good choice. Promoting the benefits of healthy plant proteins whilst minimising your intake of processed foods, going flexitarian can be a positive way to ditch the all or nothing mentality and focus on moderation. If you are looking to make dietary changes, speaking to a professional can help. Working with a nutritionist may help you to navigate any new changes you are looking to make. To find a professional near you, use our advanced search. Why stomach acid is so important to your health Could your digestive problems be due to gut dysbiosis?